Luke Skywalkers Tatooine home is actually a hotel in Matmata, Tunisia. As Star Wars fan knows, before Luke’s Jedi days he lived with his Uncle Owen and Aunt Beru Lars who were moisture farmers on the planet Tatoonie. Even though Luke left his home to save the galaxy and whatnot, you can still visit. George Lucas shot the Tatooine scenes in 1976 at the famous Hotel Sidi Driss in Africa. The hotels storage room was the Lars dining room. In 1995 Phillip Vanni, a French Star Wars fan, helped remodel the store-room and turned it into a Star Wars-themed restaurant and bar. In 2000 Lucas returned to shoot scenes for Star Wars: Episode II- Attack of the Clones. The Tatooine set was rebuilt and still remain on site as part of the hotel’s decor. According to Gonomad.com it’s $10 a night per person including breakfast. “The hotel was built centuries ago by the indigenous Berber people of North Africa. Refugees would dig detailed cave locations to hide away and defend themselves from attackers… It wasn’t until 1967 that Matmata became more widely known after it received emergency support from surrounding cities, following a devastating rain season. 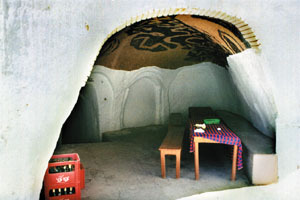 New, above-ground residencies were built, but many of the classic cave dwellings were repaired and still serve as the primary housing facility.